Another great morning at Sooner Rotary! After a rousing chant led by Alan Southerland, we were ready to take on the morning! Zigga, zigga, oi, oi oi! Congratulations to Luke Mulholland and Chad Vice on earning their blue badges. Way to go! Glenda Thomas presented two Paul Harris “plus 1” recognitions today to CE Jones and Denise Kueny. Thanks for your support of the Rotary Foundation. Le Tour de Vin is scheduled for June 10th and 11th. Sponsorships are still needed; we are nearing our goal of $55K. See Judy Simpkins for more details. Invitations were mailed and you should have received yours. Purchase tickets for one or both of the events. See www.letourdevin.com for more information. Nothing says summer like a Sunday night at Clear Bay Grill. Join us June 5th at 5:45 PM for dinner, music and fellowship. Fred Benenati will provide more details in the coming weeks. Watch your inbox! The American Cancer Society's Relay for Life is Friday night. Come on out and support this great cause if you are able. Contact Amy Bass for more information. Next week's meeting will be held at the Barry Switzer Center. Look for an email with more details on the tour this week. Ted Rose and Susan Hill with Project Amigo located in Colima, Mexico, presented today’s program. There is a lot of great work being accomplished for the children and adults of this region. Volunteer weeks are available. Check out their website: www.projectamigo.org for more information. Sooner Rotary will be well represented at next week's Rotary International convention. 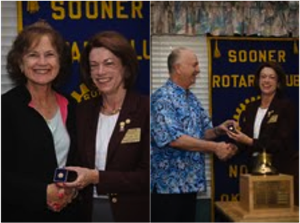 Look for updates on our Sooner Rotary Facebook page. A full report will be made after we return from New Orleans.